Earlier this year, Mad Men Football (working title) was announced as being effectively in development for the Wii U, but not officially in development. Development started on Mad Men Football last year and development has continued since it was first announced, but there has been a BIG change to it during the development process after getting officially approved as a Wii U developer. In early August, it was said of the game, "A fair warning would be, what the game was, is not what the game is becoming." And, a post shortly after that one said, "What the prototype was, is not what the game is becoming!" The difference between effectively developing the game before being an approved Wii U developer, and then becoming an officially approved Wii U developer is what resulted in the big change and the decisions leading to the change. What is the big change that has happened to Mad Men Football since first announcing it, and getting approved as a Wii U developer? Watch the pre-alpha promotional screens trailer below from the current work-in-progress, for the first in-game look at George Washington and the big change in development to the game from what the prototype was last year and earlier this year! Follow the AE Games accounts on Twitter and Facebook for updates, conversations, and possibly even future giveaways. 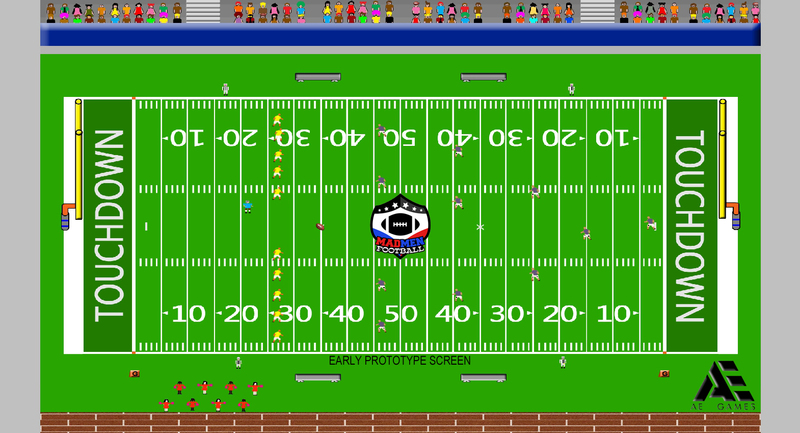 Mad Men Football early prototype screenshots. A few weeks ago, a screenshot of Mad Men Football's (working title) early prototype was sent to several winners of a giveaway. Even before that though, early prototype screens had been shared with a few people "off-the-record" earlier this year. And while screenshots don't necessarily confirm a game is in development or even real, and I think some have been absolutely correct in maintaining a skepticism about the game not knowing that early prototype screenshots had been shared with some, even if there is a video or trailer of footage that doesn't even necessarily mean a game will see release, as many Wii U owners probably know. With that said though, below are two screenshots showing the assets I edited and created for use in the early prototype last year (2013). 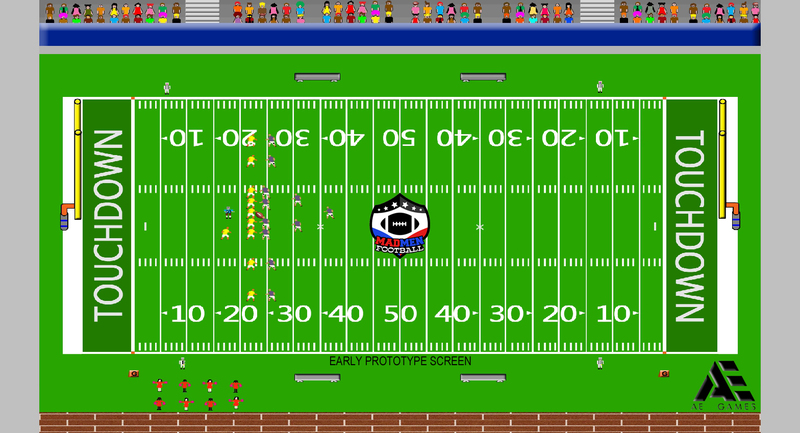 The only things added to these early prototype screenshots that weren't in the screenshots already shared with some are the AE Games logo towards the bottom right corner, the Mad Men Football logo in the center of the field, and the "EARLY PROTOTYPE SCREEN" text. Offensive passing formation play. Offensive player with blue jersey is the QB. Was colored blue for easier tracking while running plays in the very early prototype. If anybody missed the previous post on the new logo designs, they were both done by Clayton Belcher, of Jolly Crouton Media. 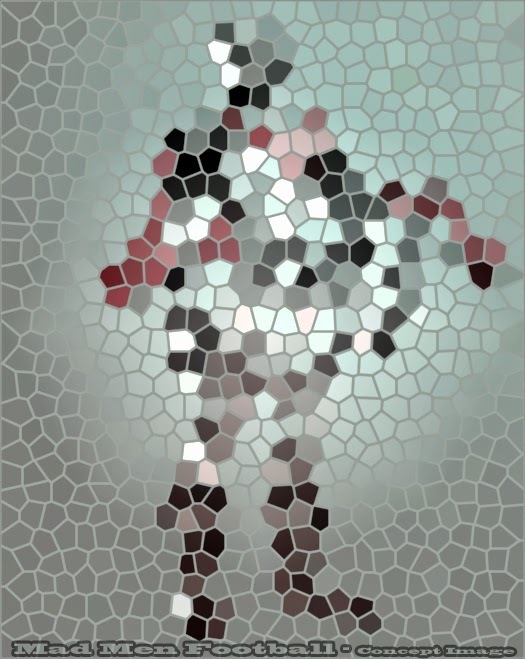 Work has continued on Mad Men Football since last year though, and the players' visual style has been chosen. I am still self-funding the game, and have been concentrating on the programming side of things myself. I am working on something I hope to share with everyone next week that will show the visual style I am aiming for in the final game. Follow the AE Games accounts on Twitter and Facebook for updates and conversations, and possibly even future giveaways. If you have questions about Mad Men Football and are a member of the press, send questions to PressAEGames@Gmail.com. If you're Wii U owner or just have comments/questions in general about the game in development, feel free to send those to ContactAEGames@Gmail.com. A Mad Men Football retro-reverse reveal, & Armillo fun! While I haven't publicly released any screenshots of Mad Men Football outside of the concept art and a portion of the football field, some associated with certain sites have seen a few screens "off-the-record" of the assets I was using for prototyping and programming earlier this year. So, "Here's where the fun begins. ", as a famous smuggler once said. What is this retro-reverse reveal? I'm going to send five people a portion of an image from my in-game Mad Men Football prototype I had up and running last year with the assets I was using for it, by mail (not email, but a physical mail delivery). So, it's a bit retro doing an image release by snail mail these days, and it's a bit reverse by showing the prototype assets first, instead of first showing off an actual in-game asset or even a trailer. The five people that win the giveaway can share their image with any site(s) of their choice if they want, and they will also receive other promotional package items (like what Shawn Long of Nintendo Enthusiast received in June, but not exactly the same) with the image. WARNING! What the prototype was, is not what the game is becoming! I have played and beaten Armillo, but not to 100% yet! If you own a Wii U and have been even a little bit interested in the game, I suggest giving it a try. I was so impressed with the game after playing through several of the levels, I contacted Fuzzy Wuzzy Games about maybe paying for a download code for it that I could gift/give away. Instead, the awesome team behind Fuzzy Wuzzy Games agreed to this cross-promotion! So, not only will you receive some Mad Men Football items via snail mail, but you will also receive a Wii U eShop download code for Armillo in the package as well! This giveaway is open to U.S. and European residents only. It will be for two (2) U.S. Armillo eShop codes and promotional packages, and three (3) European Armillo eShop codes and promotional packages. 1) Follow @ArmilloGame on Twitter, leave a comment on the Armillo trailer above and include your Twitter handle in that comment (example: "Armillo looks awesome! I hope to win, @YourTwitterHandle. "), and RT this Twitter post! 2) Follow @AEGamesNC on Twitter, leave a comment below on this post about your favorite Wii U game or feature or make a tweet about it including the hashtag #MadMenFootball, and RT this Twitter post! The first winner drawn for each U.S. and European region will receive a promotional package closest to what Shawn received, while the next winners drawn will receive a promotional package but not necessarily with all the exact same concept art prints included. The giveaway runs from Thursday, August 7th through next Thursday, August 14th, ending at 9:00 AM (PST). Winners will be contacted via direct message on Twitter to get the necessary information for mailing out the promotional packages. I have been pretty much silent on the site since the last character reveal in March. So, being the start of a new month, I thought it would be a good time for a little update, and also a good time to answer some questions that have arrived via email and some statements/questions I've seen in comments around different sites in the last few months. Some that have been following announcements since the game announcement in February and Julius Caesar's reveal in March, noticed that the characters in the promotional package were the same characters revealed in February and March. One big reason for using George Washington and Julius Caesar in the promotional package, is that even with the great coverage the initial press release, game announcement, and Julius Caesar reveal received on many sites, there are many more sites that didn't cover any of the announcements, or some that just covered the February announcements. For example, Shawn had not seen Julius Caesar before he received his promotional package, which was over 2 months after I had revealed Julius Caesar as a player for the game. As an indie developer and self-funding this project, I'm trying to make sure that as many sites can/will cover the game as possible (and your help in this is appreciated!). And I understand that on some general Nintendo news sites, this might mean some see the same thing(s) a few times. Shawn also mentioned a new Mad Men Football logo on one of the concept art pieces included in the promotional package, and that new logo was also designed by Clayton, like the new AE Games logo. Development? Is development still happening on the game? Yes! Development has continued on Mad Men Football, and if any of you missed it or were wondering if my non-developer status with Nintendo has changed since February, I shared with Nintendo Life in early June that I have been approved as a Wii U developer. Screenshots? Why haven't I released any images of in-game assets, screenshots, or even a video? In short, proper timing and encouragement. When the game was announced in February I had stated, "And I will probably be releasing screenshots from the prototype in the next few weeks, but I didn't want people to get discouraged at the art assets I'm using (if you can call MY assets art)." I also said in that post (and it was obvious to many before I even stated it), that I'm not an artist. I'm focusing on the programming side of the game. But, I also said that, "Being a self-funded project, and as a developer (programmer) first, the art and animation will be done by an actual artist/animator." So far, I haven't shown much outside of the concept art for two of the players in the game, and before I show any current in-game assets, screenshots, video, or announce any other characters, I am going to show the assets I created last year for the first prototype and programming purposes. The first asset(s) shown will be done by what I'm calling a retro-reverse reveal, and shared in a fun way that will be detailed soon in another post. These won't be bullshots, but will be the actual horrid assets I created. A fair warning would be, what the game was, is not what the game is becoming. And as always, if anybody has any questions or concerns, I think I have responded to every single email I have received since the initial press release and game announcement, feel free to contact me via email. 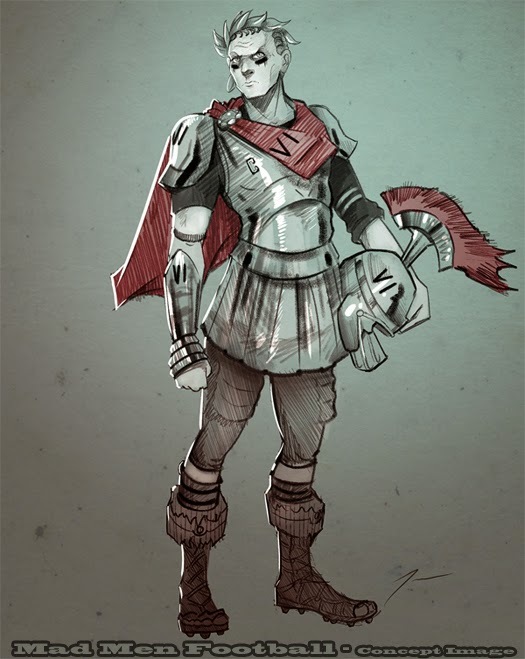 AE Games is pleased to release its latest character concept sketch, done by David Tenorio who is currently doing the concept art for Mad Men Football. It reveals the next "player" to join the roster for another team in Mad Men Football, in addition to George Washington who was revealed last month! If you're sick of betrayal, tune in to this teaser. He hopes not to fail, hail (Mary pass from) Julius Caesar! We hope the Ides of March, found you well! Today is Presidents' Day, or Washington's Birthday! If you live in the United States you may know that today is Presidents' Day, or Washington's Birthday! 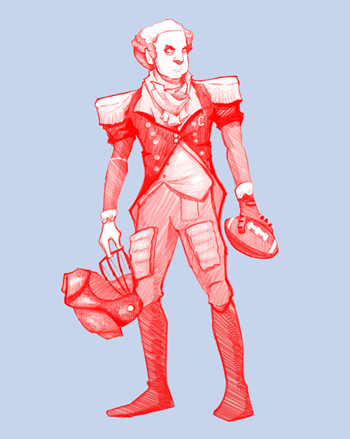 As many of you may have seen this past weekend, a concept sketch of George Washington as an American football player was revealed along with the announcement of development on Mad Men Football. To celebrate Presidents' Day, or really Washington's Birthday, and the responses I have received so far to the announcement, I'm sharing the concept sketch of George Washington, but with a slightly different color scheme than the last. Thanks again to everybody that has been sending emails with questions, comments, and encouragement!